A year ago, our gaming group found ourselves finished with the world and story we had been playing in for three years. We decided we were ready for something new. We had already decided to leave D&D 4th edition behind in favour of Pathfinder, so a new world seemed fitting. I discussed some ideas with a friend and co-GM at the time, and so began the creative process that brought forth the setting of our current campaign. We decided a desert would provide us with an interesting land for the party to adventure in. We were particularly interested in using the elements and diseases as challenges for the party, something we had not done yet. A desert’s storms and threats of starvation and dehydration gave us more to play with when challenging the party. I thought about it and after a little while I had come up with The Desert. I came up with the map below (I drew the map, and one of our group, a graphic designer, gave the map the wonderful artistic touches you see below). I simultaneously created a history for the desert, as well as the local settlements and political organizations and factions in them. What we ended up with was a massive desert once inhabited by the ancient civilization of Kymerzon, whose powers were based in the advanced magical artefacts they created. However, millennia ago this civilization fell, leaving only their magical devices. The result in the present was various powers seeking to fund expeditions to retrieve such artefacts, all desiring the power such devices had and the wealth they were worth. One of these organizations was the Gyleaon Desert Trading Company (GDTC), which came to play a key part in my discovery and invention of this world. It was a company created by the nation of Gyleaon, independent of the government of Gyleaon but very much serving said government’s interests. They were very much inspired by the British East India Company. I quickly found that they were a company that would be seen around the world in which the Desert was. The GDTC became a way to explore this world and still make sure the players felt there was something around they understood. It drew the world together. So, or a year we adventured in the desert, however we tend to run a number of mini campaigns alongside the main campaign. Often they are short, only one or two sessions long, perfect for over holidays or when an old member of the group drops into town and wants to play. This is where this world really began to take shape. I imagined the Company would have trading ships, and invented a South Pacific style island area, and ran an adventure there. I ran two other adventures in other areas of the world, using the Company or Gyleaon as a touchstone for the players. However, as you might have guested, both the players and myself felt the Southern Seas could be further explored. 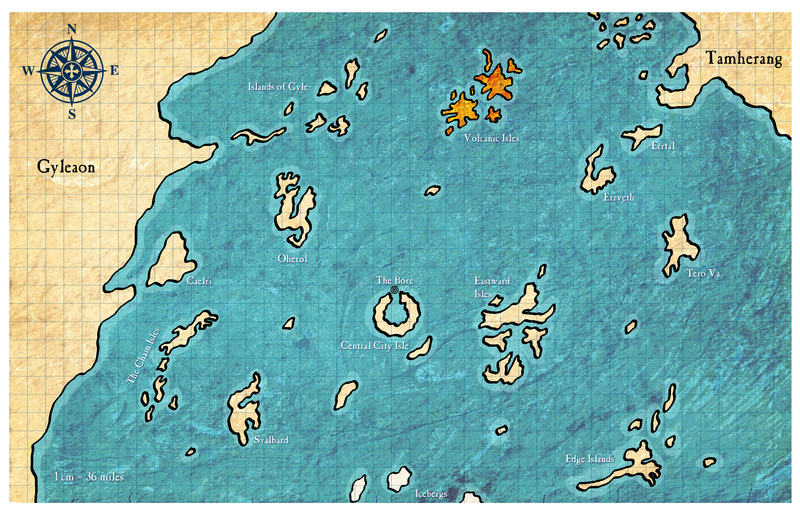 So, I came up with the details to create the current campaign setting, the Southern Seas. Again, I drew the map below of the Southern Seas, and our graphic designer worked her magic on it. 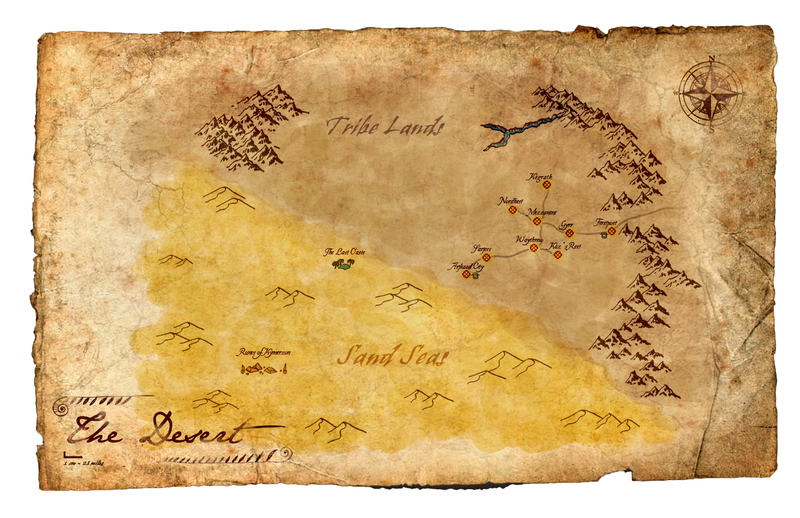 The history of the Southern Seas, as with the Desert, both evolved out of the map and influenced the map’s features. I knew thanks to the earlier mini-campaign that the Southern Seas were filled with island chains and the GDTC had a strong presence there. From there the following history evolved. The Southern Seas and the islands within them lie between two nations, Gyleaon and the Dominion of Tamherang. Some of the islands have settlements, particularly Central City Isle, which have their own independent governments. However, most settlements, ports, and shipping in the Southern Seas are sponsored and run by the GDTC. The company, with the nation of Gyleaon behind them, are the dominant power in the seas, and even the island governments have learned to work with them. Gyleaon in a world power, and the Southern Seas are one of their most profitable spheres of interest. Meanwhile, Tamherang is an up and coming power. Two centuries ago, the provinces of Tamherang were warring states of humans, with elves and dwarves being common enough. No single state could conquer the others. However, about 175 years ago, a cabal of tieflings came to power in several nations at once. The seized power in coup d’etats, with strong if small groups supporters. They joined their nations together, and swiftly conquered the other nations. After they crushed the army of the first state, the others surrendered, and the tieflings proclaimed the Dominion of Tamherang formed. They called themselves the Duma, secured their power, ruling by council, and promoting tieflings as a superior race. About 45 years after they took power, they started a war Cyrael, an old elven nation. While they had early successes, the elves soon drove the forces of Tamherang back, and forced peace talks. Since then they have done little to exert themselves. Yet, over the last fifteen years, the Dominion of Tamherang has been showing interest in the Southern Seas, and tension between Gyleaon and Tamherang have been on the rise. Tamherang made a request of Gyleaon 23 months ago. For a considerable sum to be paid to the GDTC, the company and Gylean would allow Tamherang to take over the island of Erryeth. Gyleaon agreed in the interest of avoiding a conflict, and the company bowed to the directive. However, a single Captain in the GDTC navy who called Erryeth home said no. When this man, Jalastar of Erryeth, heard his home had been sold out he took his own ship, the Soul of Erryeth and five other ships he had convinced to join him, and over the next 21 months he led a gurrenllia war against the Tamherang forces attempting to secure the isle. The rebellion gained public support in the islands of the Southern Seas, and in Gyleaon. Eventually the war became too embarrassing for Gyleaon, and the Vosi were turned to. The Vosi are a dark legend in Gyleaon. Secretive yet known by reputation by all in Gyleaon, they are officially Gyleaon’s intelligence agency. Unofficially, they protect Gyleaon, to matter what is required. Assassins, investigators, terrorists, diplomats, and generals, a Vosi is known for his or her ability to complete the task. This time, the task was simple, break up the rebellion, capture Jalastar of Erryeth, and bring him to trial. Through infiltration they allowed the forces of Tamherang to crush the rebels, yet Jalastar escaped. This history of the Southern Seas, this story, will be continues in the campaign we are now running and of which I will soon be posting write ups. Look for those soon, and if you are interest in the story, check out the Prologue if you have not already.